(Image source: Teknisk Ukeblad 31.10.2016), Per Ivar Nikolaisen. ASKO Vestby Carport is located in Vestby municipality (Akershus county) in eastern Norway (59.59°N, 10.74°E). 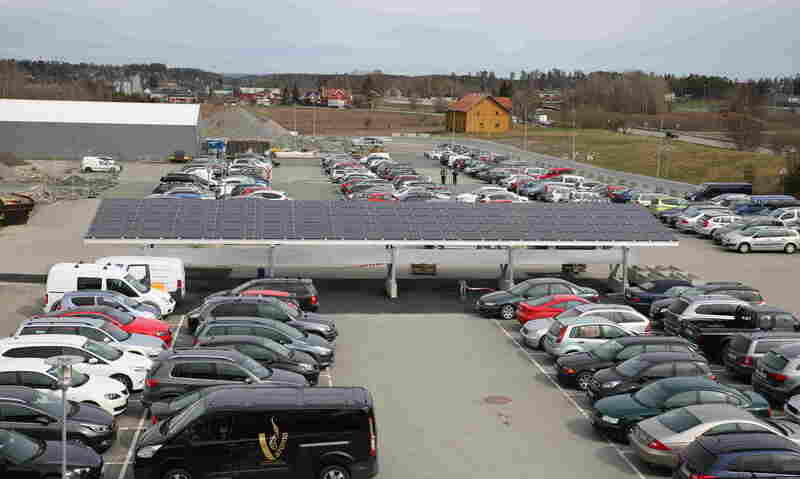 The carport consists of a free-standing rack of bifacial PV modules, providing power for charging of electrical cars. (Image source: Teknisk Ukeblad 12.05.2016). The system is building intergrated, as the PV modules constitute the roof of the carport. System simulation, design and installation was performed by the PV supplier FUSen. 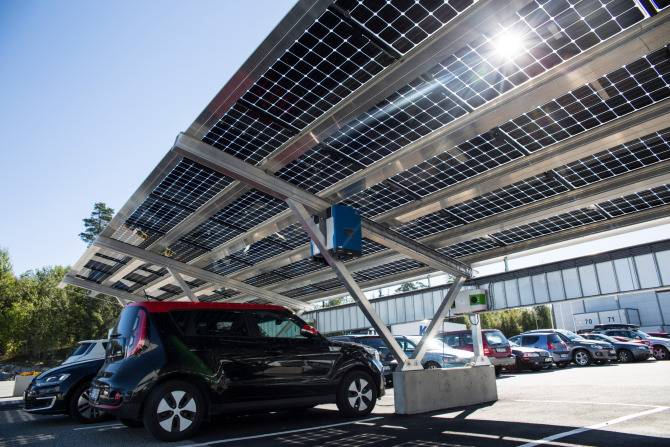 The carport solution was chosen by ASKO as a marketing effort, creating visibility around their environmentally focussed strategy and PV-investments on a number of their company buildings. The aesthetical and marketing value of the system was in this case the decicive argument for selecting a BIPV carport. The use of bifacial modules were more expensive, but attactive due to the visibility of the solar cells also from beneath. As all the power produced is used for charging electric cars, there are no technical building requirements for energy that have to be fulfilled by the carport. Robustness against snow and wind loads is important. Dimensioning was performed according to local loads, compromising between reduced snow load (favouring a steeper BIPV roof) and wind load (favouring a flatter BIPV roof). The system is assumed to be close to maintenance free, not requiring cleaning. Lightening protection is not installed, but the system is earthed. (Image source: (Left) Teknisk Ukeblad 12.05.2016. (Middle) Imgrum, Moss glass og fasade AS. (Right) FUSen. 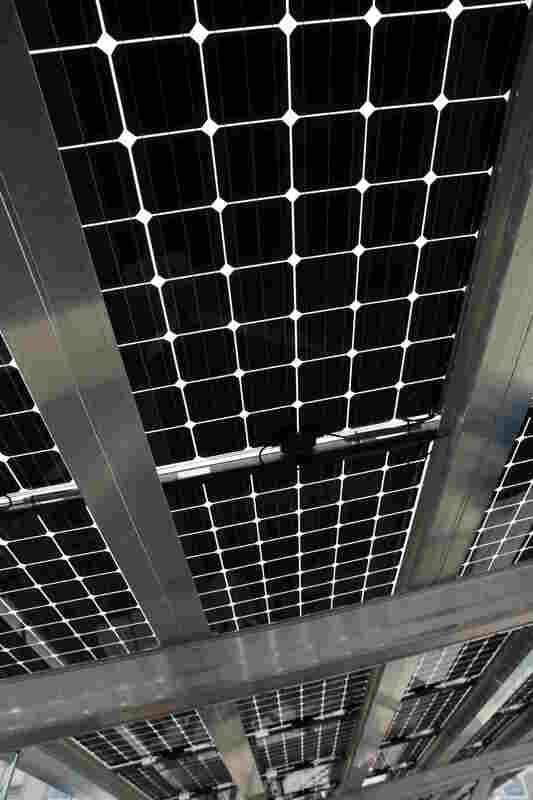 The PV modules are bifacial glass-glass modules, framed, using aluminum supports to prevent corrosion. The string configuration is sideways to minimize the influence of shading on output power. The free-standing rack ensures unrestricted air flow around the BIPV modules, which is beneficial for maintaining high efficiency. 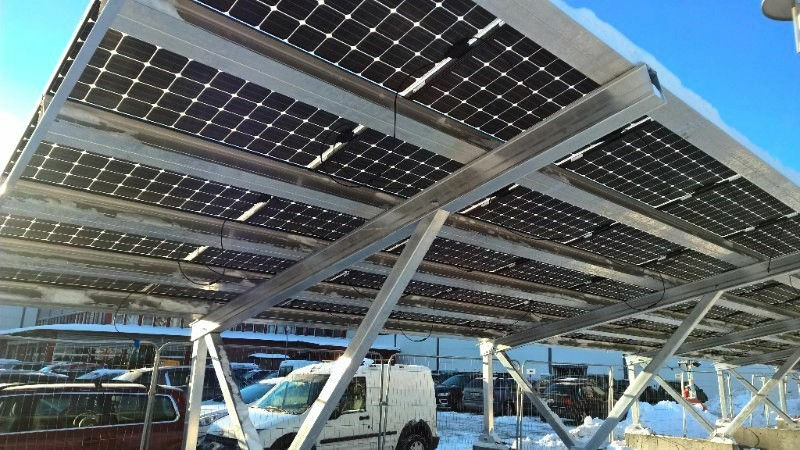 In winter, snow may cover the front surface during short periods before melting or sliding off the pitched roof, whereas light reflected by snow on the ground may give slightly higher output from the backside of the bifacial modules. 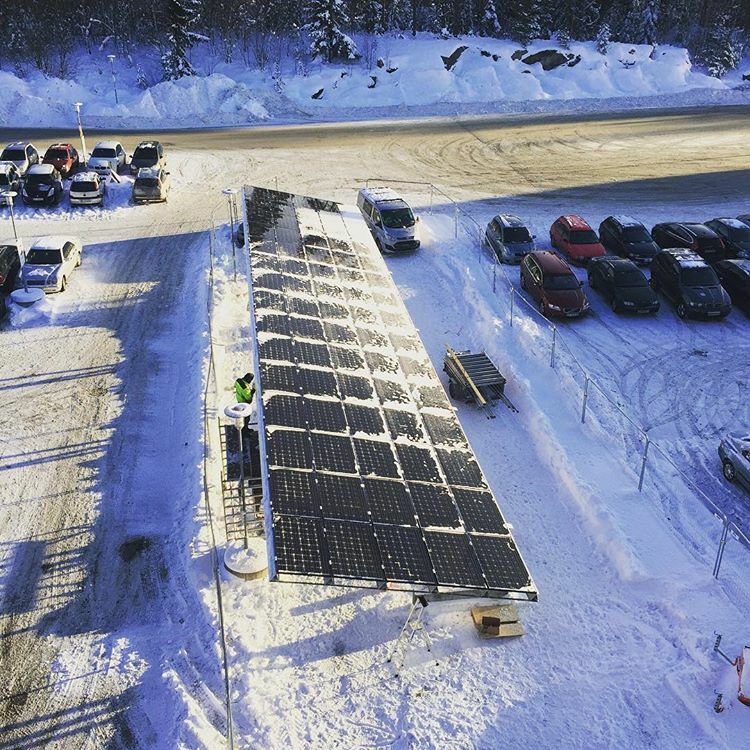 The PV modules are facing due south, with a tilt angle of 12 degrees. PV production data is available from 2015 onwards.The predicted annual yield from the system was _ kWh, giving an estimated specific yield of _ kWh/kWp. More information about the ASKO Vestby Carport can be found in articles published by ASKO 19.05.2016 ("Ny solcelleteknologi hos ASKO ØST. Nå kan ASKO-ansatte på Vestby lade elbilene med strøm fra solceller som også fanger lysrefleksjon fra bakken. "), and Teknisk Ukeblad 12.05.2016 ("Disse solcellene fanger lyset fra begge sider. Nå lader de elbiler på Vestby. ").